Rooms Sleeps 9, Br 1: bunk with full and twin, Br 2: queen and twin sleeper sofa, Br 3: king and twin fold out. This home sleeps 9 including the twin sleeper and fold out. David L from Cupertino, CA does not recommend this vacation rental. The pictures looks good and the owner did attempt to fix the place up. My guess is this is not a professional remodel. There are just so many issues with the house which makes it hard to give a good review. Downstairs Alarm - Chimes every 5 min, called properly management, left VM and no response. Multiple door nobs are not secured, handles falls off. Internet does not work well and requires a reboot every hour. Water in the bathroom upstairs is unreliable, get ready for a ice cold bath! Up stairs sink is about to fall off the wall and the door is really hard to close. I recommend looking elsewhere to vacation rentals. Overall, we were able to enjoy our stay at this place. 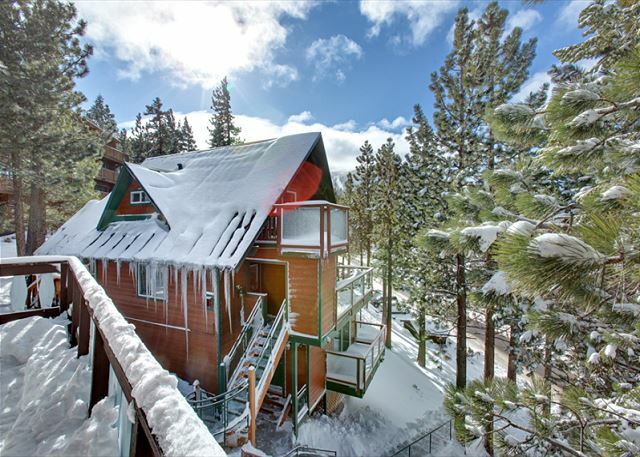 It is modest in size and appointments, clean and comfortable, and the location is fantastic for skiing at Heavenly and South Lake Tahoe. The property mgmt was responsive and gracious. Well stocked kitchen, plenty of paper towels/toilet paper. There were minor issues like loose doorknobs, burned out light bulb over the kitchen table, and also they did not provide sheets for the two single pull-out beds, despite that we specified we were a full party of 9 ... we had to drape blankets over the mattresses. So not perfect, but still a decent and comfortable place overall. We appreciate the stay. Take note there are many (many) stairs leading up to this property, including a rather narrow spiral staircase. Great ski weekend with friends. 1. booking was very easy with this company. 2. they always answered their phone, even when I called with a simple question. 3. condo was clean and set up nicely. 4. We arrived late and there was a light on for us and the heat was on, very comfortable! I will recommend this condo and company to anyone. This was our annual guys trip. The boarding was epic! The condo was in a great spot for a ski/snowboard trip, close to the resort and still close to town for the night of going out. And there was a great view out the living room, the trees were kind of in the way of the lake view but still amazing. This may be our new spot.